Founder of White Stag Art Group: Biography, Paintings. The Irish-Hungarian landscape artist, still-life and figure painter Basil Rakoczi, was born in London in 1908. His mother, an artist's model, was a native of County Cork. After a childhood spent in England and France, he studied painting and drawing at the Brighton School of Art. He then went to Paris where he studied fine art at the Academie de la Grande Chaumiere. On returning to London, Rakoczi first worked as a commercial artist before turning to painting full-time. In 1935, Basil Rakoczi founded the Society for Creative Psychology, mirroring his twin interests in art and psychology. He soon met and became close friends with Kenneth Hall, a like-minded artist, and they formed a new art movement called the White Stag group. The 'philosophy' of the White Stag group - which they named Subjectivist Art - was to encourage an exploration of psychology in painting. They also believed in aesthetics as an objective in art. In 1939, Rakoczi and Hall moved to County Mayo, made several trips to the Aran Islands, but soon returned to urban life in Dublin, where they associated with other forward-thinking Irish artists like Evie Hone, Mainie Jellett and Patrick Scott. Rakoczi's White Stag movement was a vehicle for the introduction of modern art ideas to Ireland. It was involved in the Irish Exhibition of Living Art and also influenced Gerard Dillon and Louis le Brocquy. In 1944, the group held the "Exhibition of Subjective Art" in Dublin without unduly impressing the critics. Meantime Basil Rakoczi was also exhibiting as an individual. His paintings were shown in a number of exhibitions during the war, including: the Water Colour Society of Ireland, the Munster Fine At Club, and the Royal Hibernian Academy (RHA) (1942). 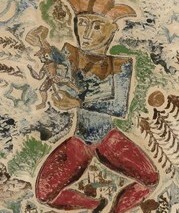 In addition, he held three solo shows in galleries in Dublin (1941-2). After the war, Basil Rakoczi left Ireland and in due course settled in Paris. However he continued to exhibit with the RHA and the Irish Exhibition of Living Art, as well as the Dublin Painters Gallery during the 1940s and 1950s. In addition, his paintings were shown in France, the Netherlands, and other European locations. He died in London in 1979. In 1990, a retrospective of Basil Rakoczi's work was held at L'Atelier del la Danse, Paris. This was followed a year later by a retrospective exhibition in Dublin, and in 1996, the Dublin Gorry Gallery displayed over 50 of Rakoczi's paintings. The auction record for a work by Basil Rakoczi was set in 2006, when his landscape painting, entitled Mediterranean Composition (1953), was sold at DeVeres, in Dublin, for €24,000.  For details of other painters from Ireland, see: Irish Artists: Paintings and Biographies.  For more about ex-patriate European artists in Ireland like Basil Rakoczi, see: Irish Art Guide.  For more about the fine arts, see: Homepage.